“Stress. It makes your heart pound, your breathing quicken, and your forehead sweat. 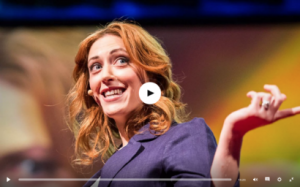 But while stress has been made into a public health enemy, new research suggests that stress may only be bad for you if you believe that to be the case…How you think about stress matters.” This is the argument that psychologist Kelly McGonigal makes in her TED talk, urging us to turn stress into an ally instead of an enemy. How much stress did you experience last year? Do you believe stress is harmful to your health? Those that experienced a lot of stress and believed stress was harmful died earlier than those that experienced a lot of stress, but believed stress wasn’t harmful. The latter group had the lowest risk of dying compared to any other group in the study, even the ones who experienced little stress. Kelly McGonigal asks, “Can changing how you think about stress make you healthier?” The science says yes. When we change our mind about stress we change our body’s response to it. Our bodies respond to stress with increased heart rate, sweating, and elevated breathing. We tend to interpret these signals as anxiety, but they can also be interpreted as the body becoming energized and preparing for a challenge. Kelly shares that in the typical stress response the blood vessels constrict. However, viewing stress as a natural response didn’t constrict the vessels of test subjects; they stayed relaxed, which is what happens in the body in moments of joy and courage. Stress stimulates the release of oxytocin, the hormone that fine tunes our brain’s social instincts. It primes us in ways that strengthen social relationships. The pituitary gland releases it as part of the stress response, just as adrenaline is released. But oxytocin drives us to seek support. Therefore, our stress response has a built in mechanism for stress resilience and that mechanism is human connection. “Caring creates resilience,” states Kelly. “When you view stress as helpful, you create the biology of courage. When you change how you view stress, you’re saying: I trust myself to handle life’s challenges. And, you remember, you don’t have to face them alone.” Finally, she says, “Chasing meaning is better for your health than trying to avoid discomfort.” That’s a choice that moves us out into the world, where a life well lived creates a meaningful life.